The end of her first year, Christie met a boy named Dan. He was absolutely smitten with her from the get-go. During his vows, he called it love at first sight, for sure. It was not the same for Christie. She was slightly interested, but cautious. She always thought she’d “know” when she met the right guy — but she grew in love over the months Dan carefully pursued her. They started dating in the Fall of 2009. It was in the Spring of 2010 that I met Dan for the first time at their portrait session. It was going to be their first time apart since dating, for 3 long months in the summer. This session was part of their “goodbye” — I loved it. Time passed and soon, they had been a couple for two years. Christie and I, of course, chatted about her wedding someday. Her and Dan knew they wanted to be together, forever. 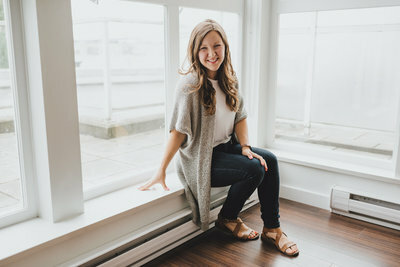 But Dan was graduating two years before Christie, needed to go home to Alberta for a job, and Christie needed to stay in Langley to finish her nursing degree. Two looming years in front of them. It was a total answer to prayer when Dan managed to find the perfect job in Langley a year after graduation… meaning Christie and Dan could be married before Christie’s last year of school. I was thrilled when Christie became engaged last December — and she was completely surprised at the early proposal — which was the best thing! Christie picked her wedding date around quite a few things. Dan’s family traveling from Alberta, her parents and sister traveling from Haiti [where they’ve lived as missionaries for almost 10 years now] and also, my schedule — which is a nightmare in the summers! I was excited when we found Friday, September 7th that worked for everyone. Because I had a wedding to shoot on September 8th in Vancouver, Christie flew me up Thursday morning and I was able to spend all day Thursday and the wedding day Friday before flying back to work. I love the “people” part of a wedding day. That part never gets old to me. I feel like an honorary family member on most wedding days. It was even more special being that Christie is a great friend of mine and that her family doesn’t live here. It was a blessing to get to know her parents, Rod and Debbie and all of her siblings. They are truly an incredible family. I was so inspired and refreshed by their heart for Jesus and their heart for the work God wants to do all over the world — but specifically in Haiti. Christie and Dan’s first look took place in the backyard of the home, underneath the arch where they would become man & wife in a few hours. Christie was nervous and bubbly, and Dan was anxious to see his bride. They saw, they hugged, they wanted to kiss but decided to leave that until the ceremony — so their “first kiss” would be the “first kiss” of that particular day. ;) As we wandered down to the beach, to the side of the house and out to the front street Dan remarked, “We’ve waited 3 years for this!” And as they walked hand in hand, I couldn’t help but marvel at how faithful the Lord is. And how good His plan is. The ceremony took place at 3 o’ clock, under the scorching hot afternoon sun. Before Christie walked her 6 bridesmaids, arm-in-arm with Dan’s 5 groomsmen to the soundtrack of “I Will Wait for You” by Phil Wickham. [Music is SO important to me on a wedding day. Or on any day, for that matter. Christie nailed it with the music choices.] During the official registry signing, Dan’s brother and best man Ben sang a duet with Christie’s bridesmaid Brianna. The song is by Jenny & Tyler and called “As Long As Our Hearts are Beating.” 1) Ben and Brianna have ridiculous voices. INCREDIBLE. 2) It was my favourite performance at a wedding, ever. 3) This song has been on repeat ever since Friday. Wow. Christie and Dan and their bridal party ran down the aisle [literally ran. well, danced and ran] to “White Dress” by Ben Rector. Another great choice. Christie and Dan chose to do a First Look even though they had 2 hours in between their ceremony and reception because they wanted to spend time with all of their guests. Everyone traveled at least 4 hours to be with them on their wedding day and they wanted to honour that. Christie had decorated the backyard and the beach so well. Personal photos, hand-painted signs everywhere, refreshments and drinks available, lawn games and boat rides to enjoy the afternoon. The reception was held at Quaaout Lodge a few blocks down the road and once again, Christie did an incredible job with details. Each table was named after a place that meant a lot to the couple: British Columbia, where they met, Canada, where they were both, Haiti, where Christie lived for years, Lithuania, where Christie’s family lived for a time, Alberta, where Dan is from, etc. And the florals have to be one of my favourite parts of the day. Christie’s aunt Pam did an amazing job on everything. Christie and Dan, I love you guys. Excited that you’re now living 3 minutes away from me. Excited for all the future holds for you two. Excited for you two to walk in the blessing God has for your marriage! so beautiful, jamie! lovely couple, lovely details (those flowers are amazing)! Beautiful photos! I have spent two weeks with the Wray family in Haiti on mission trips and am in awe of the family. Their kindness, generosity and heart for God is something that I can only strive for. It’s very special to get to see them through your photos at such a happy time. Thanks for sharing. You are quite gifted. Jamie, I swear, you are like the wedding photog queen. You tell such stories of all the people you have come to know and love through shooting weddings and being a photographer, and it makes me crazy excited for my future and all that is to come. I’ll just end this by saying you are a huge inspiration! What beautiful pictures of a very beautiful wedding in such a gorgeous location. You are an amazing photographer. I have prayed for this wonderful family for several years. So happy they were all together for this very special occasion. Absolutely Fabulous Photography!! I was honored to be invited to this Wedding Celebration. Christie and Dan …you are Beautiful and the setting was Wonderful!!! Wishing You all Of God`s Blessings! I know i’ve said this before, but this is for sure my fav wedding. I love all of the pics, and the details are so gorgeous and the colors are amazing and i have lots of memories at shuswap ! Any idea what color bridesmaid dresses these are? Where are your bridesmaid dresses from? Thanks! Love this wedding, what beautiful pictures! I also would love to know where the bridesmaids dresses are from? They are absolutely divine! To everyone who asked about bridesmaid dresses, they are from a store in a local mall here, called Sakura! I think it’s Canadian. Where did she pick up that wedding dress? It’s gorgeous!